Welcome! 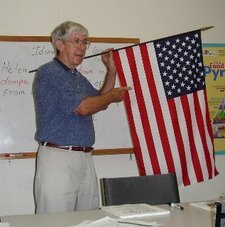 This is a website for all of my students and former students who are learning English As A Second Language anywhere in the world! MIANE is an acronym which stands for Military Intelligence Association of New England. It is a veterans' organization that I belong to which meets monthly in a restaurant in Woburn, Massachusetts. The members of this group share certain common experiences: They all at one time in their lives were special agents in military intelllgence units of the armed forces. Most were in the Counterintelligence Corps(CIC) of the United States Army. One man, Paul Giguerre, who lives in Springfield, Ma.,goes all the way back to membership in the prestigious Office of Strategic Services(OSS) of World War II. Paul at the age of 19 was inserted behind enemy lines into Occupied France before the Normandy Invasion to work with the French Underground and barely escaped with his life, but that is a story for another blog. It is too long to tell here. I decided to write about MIANE now because it is November, the month of Veterans'Day, and I have put it off long enough. Also, this is the first Veterans' Day without my dear friend, Eddie Symonywicz, or as we knew him: "Polish Eddie." He died this year and I wrote about him at that time. Although Eddie is no longer with us, I am very happy that I was able to take him to one of MIANE's meetings. You see, "Polish Eddie" was the most Patriotic American I ever knew, and MIANE is the most patriotic organization I have ever known, so the two made a perfect match. I remember that day very well. Eddie and I rode down to Woburn to the meeting at the restaurant with Dave Bianchi. (Dave had been a CIC agent in the Buffalo, N.Y. Field Office during his time in the Army and now lives in Princeton. At the meeting I introduced Eddie Symonywicz to the group by describing his record of World War II service in the Pacific. I told how Eddie continued his patriotic ways by flying the American flag in his front yard every day and the Marine Corps flag from his front porch! One never needed to know what number Bristol Street Eddie lived at; you just had to look for the flag! When I finished speaking, Eddie was embarrassed, but I didn't care. He deserved more praise than I could ever give a man like that. Al LeFebvre was ultimately smuggled back out of Vietnam aboard a cargo plane in a large crate and landed at that same airbase in Okinawa that Eddie Symonywicz visited with an MI carbine years before. We all know what happened in the time since Al's lucky escape. The French were defeated at Diem Bien Phu. America did get involved and the war to keep Southeast Asia free from communism was on. As a reward for his service, Al had the opportunity to go to Columbia Law School in New York City. This was arranged for him by Milton Eisenhower, the brother of the President. Two men visit an airbase on the island of Okinawa ten years apart under very different circumstances and both serving their country. They meet years later in a restaurant and exchange stories over clam chowder. I had the distinct honor to sit and listen to these two gentlemen and listen to their stories. Al LeFebvre and Edward Symonywicz won't be in the history books of World War II and the Vietnam War, but the puzzle would look so awful without their two pieces filling it in so beautifully. Study the following two sentences from the blog. They illustrate important points about the use of verb tense. 1. "Polish Eddie" was the most patriotic American I ever KNEW, and MIANE is the most patriotic organization I HAVE EVER KNOWN. 2. He HAD HAD negative experiences with Charles DeGaulle, the French leader during the war, and DID not get along with him. If you can explain the reasoning behind the use of the Present Perfect and Past Perfect Tenses here in these two sentences, it will be of benefit to YOU if you are having difficulty using those tenses. Definition: An iced cocktail of rum, lime or lemon juice, and sugar.